0.5 fl oz. 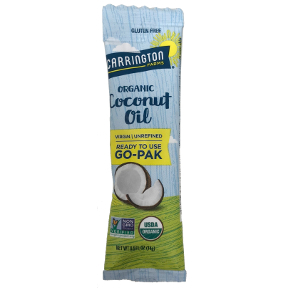 pack of virgin, unrefined, ready to use coconut oil. USDA organic. Gluten Free. Non GMO Project verified. 100% organic virgin. Mix into coffee, smoothies, or oatmeal, or smooth onto skin or hair. Simply warm pak contents to a liquid with your hands. Ingredients: 100% unrefined organic virgin coconut oil.